...Plain walls, no built-ins, etc. It's not an overly large laundry room and I had to sacrifice having a utility sink and proper mudroom because it's an upstairs laundry, but after living here for a year, I'm really happy to have an upstairs laundry. With three kids, it feels like I'm always running a load and it's much more convenient to switch loads, not to mention that I don't have to schlep baskets of clothes up and down the stairs all the time! 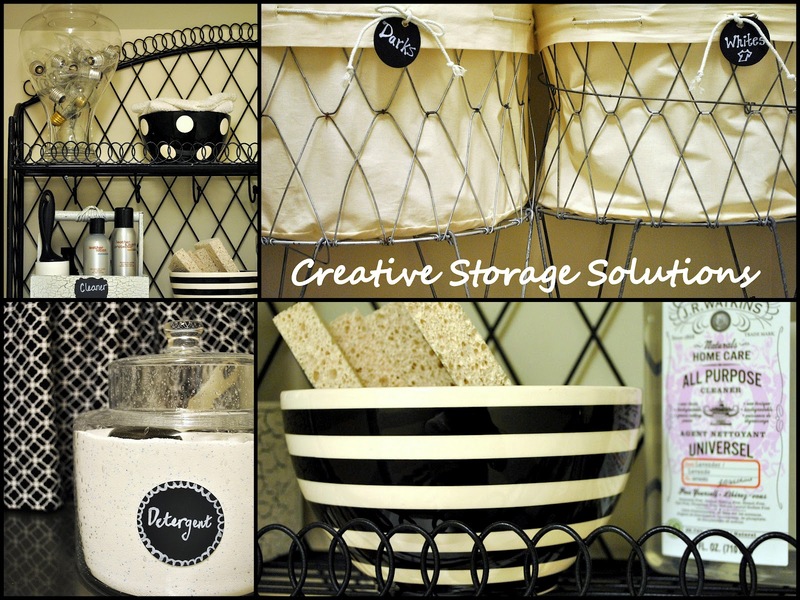 Besides the pins, all I purchased was the lumber, paint (mixed in Behr), stripe rug, and fabric for the laundry carts and the black and white valance my mom whipped up for me to hide the plumbing, making the total laundry room makeover ring at at just about $130 out-of-pocket! And I haven't forgot...I promised a tutorial on making these laundry cart liners. 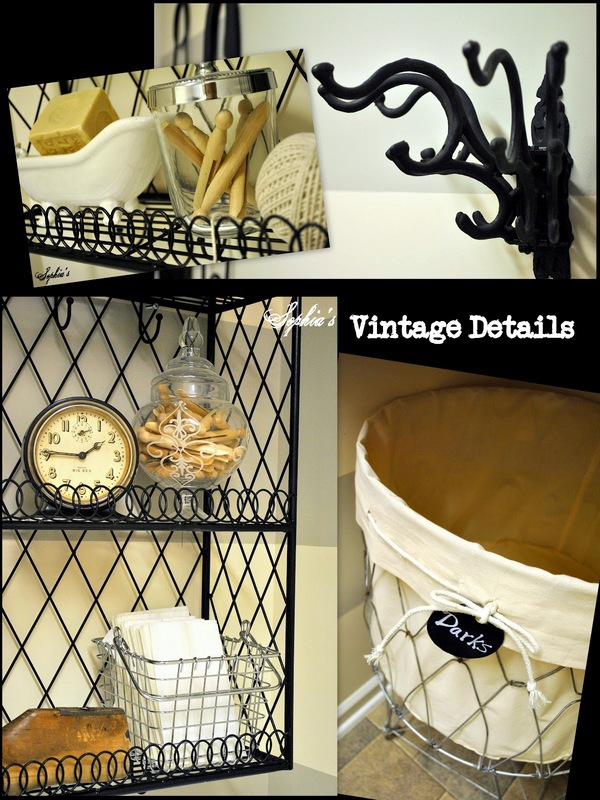 Unless you plunk down the cash for Pottery Barn's lined laundry carts, most vintage ones you come across won't have a liner. My mom and I teamed together and put together a "how-to" that will be up this weekend! That just could not be any cuter! Reminds me of a model home :) Perfection!! Enjoy it. it looks beautiful! you have done such an amazing job- love the vintagey touches and the stripes and colors! I'm in LOVE!!!! I want those carts so badly. Wonderful job! Thanks for sharing. I love the stripes, it really perks the room up. Very pretty, Kristen! Love the stripes and the folding counter. That wire shelf looks great there, too. It would not be a chore doing laundry in this pretty room. 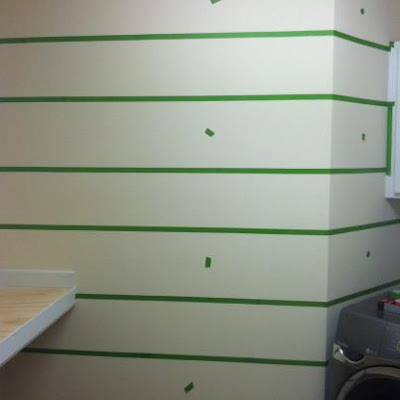 I have my eye on painting stripes on an accent wall in one of our bathrooms. What an adorable room! Those laundry carts are to die for! Love, love, love all of the details. Your laundry room looks great. I don't have the patience to do stripes. Those really look good. Your room is bigger than mine. Good job. 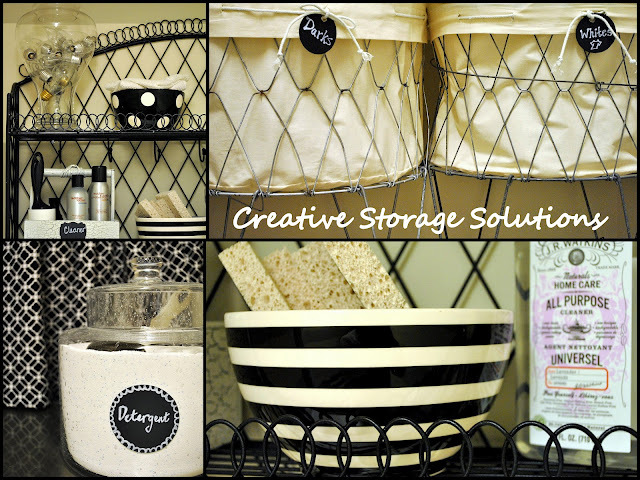 Thank you for sharing your gorgeous laundry room at Potpourri Friday! Remember to enter the Home Depot Giveaway! Your laundry room is lovely. Congratulations on your finish! 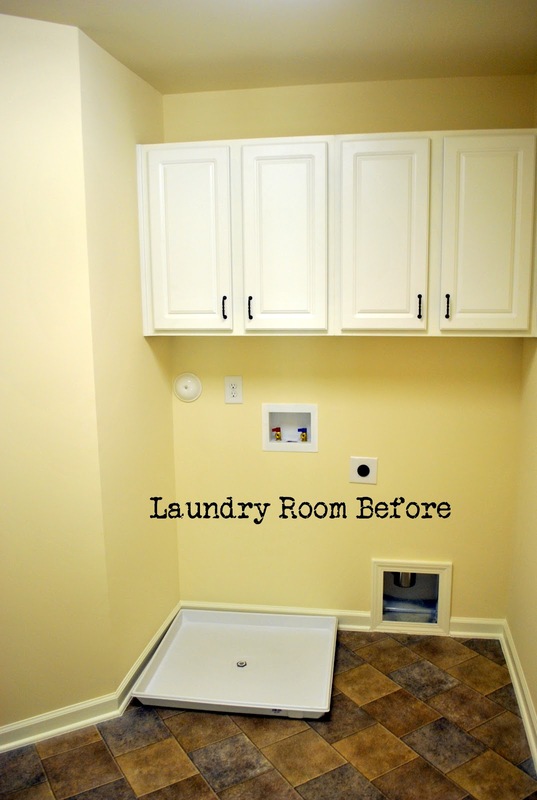 What a great laundry room transformation! That's the next dream project of mine! I'd love for you to share this at my party, Twirl & Take a Bow at www.houseontheway.com. It would make a great addition to the party! Absolutely adorable! I have a black & white striped rug in front of my washer/dryer, too. Looks great. This is great! I wouldn't mind doing laundry in here at all! Great job! Gorgeous! What a great way to update a builder basic room. Cute room! I'm a sucker for black and white. I have that rug in my kitchen! Your accessories are perfect. That came out super cute. I also like how the stripes pull your eye along the wall and away from the floor. It is great! This is so lovely that I had to PIN it!! Wow, it looks great! Love all the vintage detailing, the stripes and the little curtain is a cute surprise. Beautiful job! Whoa! This is fabulous. I would love to do laundry in a space like this. You did an amazing job of decorating. i love your laundry room!! from the striped wall to the two giant safety pins on the wall!! they're giant but ironically cute!!! Wow!!! What a transformation. The horizontal stripes are awesome. I have to say that I'm partial to stripes and walls. Everything looks great. It almost makes me want to do some laundry. Well,almost! Wow, I love this beautiful room. doing the laundry would actually be FUN here! Your laundry room is beautiful! I'd be doing laundry every day if I had a space like yours! Visiting from FJI. I love your laundry room! Especially all the vintage touches! So beautiful! I've done a few wide stripe walls in my home...both horizontal and vertical. They make a nice bold statement that gives a space a lot of character! I would love if you would post it and share it with my readers! Join the Community and share any of your creative projects! I seriously think having a pretty room like this might inspire me to do laundry more often! I am loving the striped walls and the giant pins. Awesome job. Oh I LOVE the classic black white and gray look. All the details are awesome. My laundry room is the one space that is still neglected!! this is truly beautiful!! great job! this is great! I love the stripes you did - I'm also going for back and white motif in mine with a mix of vintage knick-knacks here and there. thanks for sharing, you did a great job designing and decorating! Gorgeous - you must want to do laundry all day long! Those laundry carts are amazing and what a find! This is wonderful! I love the mini fabric curtain! What a great idea! My laundry room is smaller than yours and has no cabinets or anything in it (my only complaint about this house we just moved into 4 months ago). I need to redo it SOON because it's driving me nutso! Thanks for sharing! P.S. I may have to order those pins as well! I LOVE that laundry cart!!!! 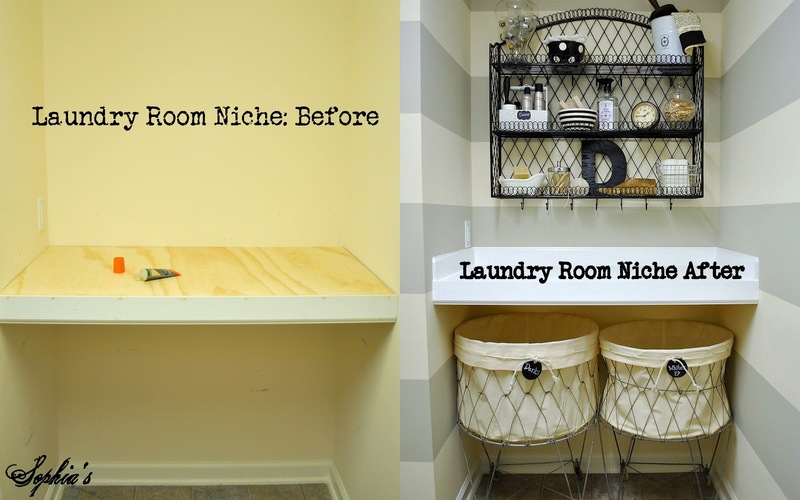 You have done a great job on your laundry room! Love the unique vintage details throughout and mixed with the modern stripes...perfect! What a wonderful and fun laundry room. Love the shelf and all of the pretties you've placed on it and those safety pins - love em! Beautiful laundry room. Love it. wow, this really is amazing. i love the stripes and the rug with the opposite way stripes...it just totally works. What a beautiful laundry room transformation, Kristen. I love the stripes, I love the way you used black, and I really love all the cool vintage items that you used to decorate your shelf--all so very pretty! I love your black and white...it's becoming a theme in parts of my home...can't wait to post my desk makeover...and Liam my 6 year old said..is our whole house going to be black and white now;)! Love your creativity and giving me hope that my projects can be done too inspiring girl!! I love your laundry room! I'll be featuring it tomorrow. I love everything about your space! You put everything together just beautifully! Amazing job!! I love your whole laundry room! But my absolute favorite part is the NOOK area and EVERYTHING in it! Oh man. I love the baskets and your style is sweet!